The crowd at the US Open loves aces, smashes, and rallies but my favorite thing from the Open is the The Honey Deuce – The US Open Signature Cocktail. Last year alone, 60,000 of them were consumed by thirsty fans. The cocktail is credited to New York mixologist Nick Mautone in 2007 and though now firmly associated with the Grey Goose family with stations all over the event, story has it that the first year it was made with Belvedere; not so catchy a name as the Grey Goose Honey Deuce for sure! 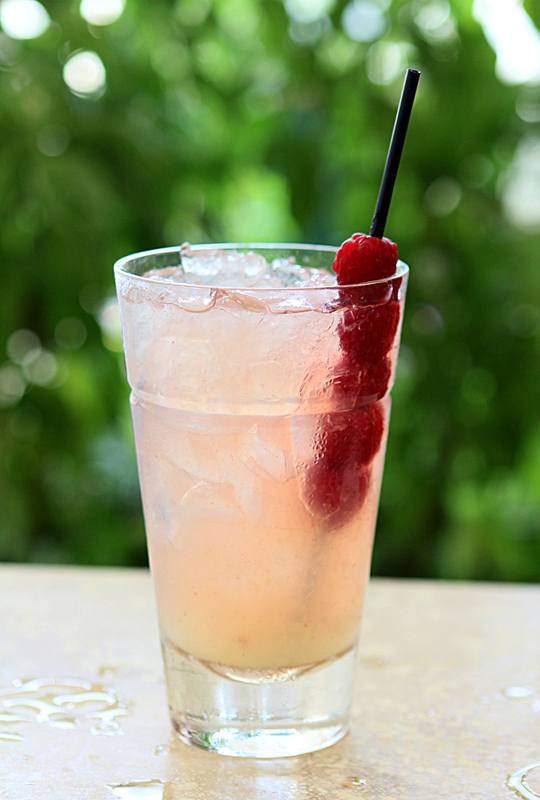 The original recipe remains unchanged though and includes vodka, fresh lemonade and Chambord Raspberry Liqueur. Light, refreshing and typically garnished with carved balls of honeydew melon; I’ve taken a bit different path but one I think many of you would love as much as I did. I may be taking on a giant leap of faith with purists but after receiving a bottle of Grand Marnier’s Signature line of liqueurs, a fantastic Raspberry Peach potion, I just knew I had to try it in the Honey Deuce in lieu of using standard Grand Marnier (which is fine if you can’t find the Raspberry Peach variety). Same lemonade if that counts but I used a favorite local vodka that is infused with honey to insure I keep the name real (the recipe just calls for a bit added to the vodka). To illuminate my switching it up I’ve got a raspberry garnish that quite frankly makes for a much prettier cocktail than honeydew; even if those greenish orbs from the original are supposed to look like tennis balls. This is way prettier AND tasty too; what I always strive for! That Grand Marnier Raspberry and Peach business. Oh M Gee. If you love Grand Marnier at all you have got to find this stuff; seriously delish. Each year, Grand Marnier (a high-end orange brandy liqueur) releases a new flavored version as part of its Signature Collection Blend series. The first entry in the series was released in 2012 with Cherry and this year Grand Marnier Raspberry Peach will be released in September. A combination of European raspberries and red peaches from the Ardeche region in Southern France; the new fruit flavors are combined with the traditional orange essences and a blend of Cognacs aged in French oak barrels. Packaged in a clear glass bottle to show off its deep rose-amber tint; the Raspberry Peach is a gorgeous hue. The neck wrapper includes a nice list of suggested cocktails including a Cosmo that I promise you’ll see soon. While nice on the rocks; I’m looking most forward to blending it with other cocktails that typically call for Grand Marnier; it will decidedly change the nature of those drinks and that should be fun to discover…want to join me? Until then…let’s get back to Flushing Meadows…do you have a favorite to win? Mix the vodka and honey and put into the glass. 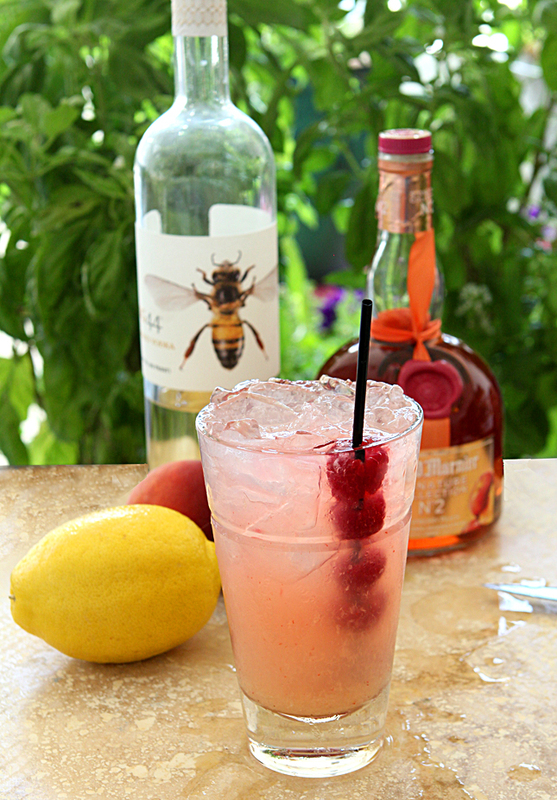 Top with lemonade to just below the rim and then add the liqueur. Stir gently. Just because…you might also scoot over to my friend Shanna’s blog ‘Pineapple and Coconut’ and check out her cocktail today; a VERY tropical blend with sweet and spicy and this really cute fruit I have never heard of. She was so sweet to include me in her post; I just want to show her some love back. Now go on…GO! I will try this recipe. I got a free sample of this new signature collection when I bought Grand Marnier , and I did not think it would be great in a margarita. So I was searching for recipes and found this pretty drink. I’m not a raspberry fan though. I don’t play tennis. And I didn’t know that US open had an official drink. But what I do know is that this will be made soon. Of course I will direct the hubby to do it! 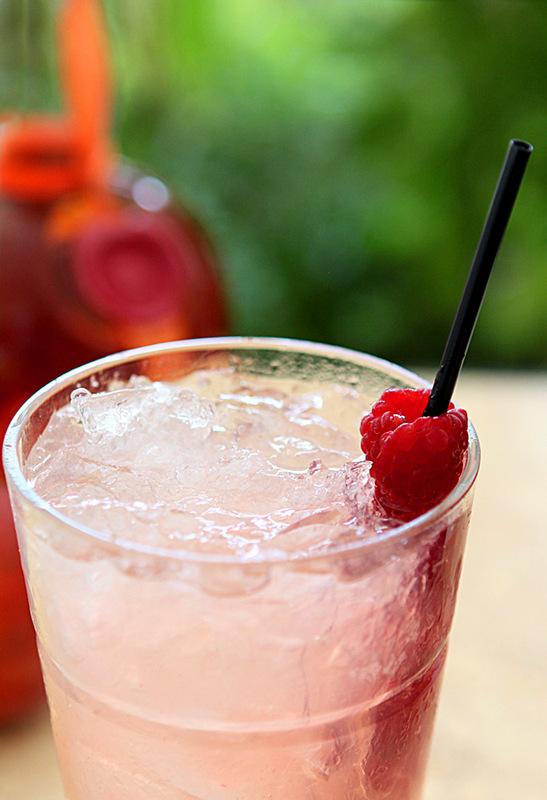 It’s a great cocktail for the spectator sport of watching tennis! Have one before summer is over; it’s terrific. Barb, I credit you for turning me on to this honey vodka you used in this Raspberry Peach Honey Deuce. I fell in love with it after using it to make the Denver Donkey (my fave!). I’m frantically searching my local liquor stores in Chicago for this Grand Marnier before it’s gone! I cannot wait to make this drink once I get my hands on a bottle! Isn’t that a great vodka…such a subtle but delicious honey flavor. The Grand Marnier is available supposedly in September Liz…I don’t know if that means tomorrow but it should just be coming into stores; it is amazing! It is a must have…we just LOVE it! Hmm, sounds like a movie! Wait til next Friday; there will be a cocktail from a book I got from this guy I know and it has Aperol in it. Hmm, wonder what book that would be hmm? Yes, please! That looks positively delightful. Cheers! Well, it’s hard work ‘watching’ tennis Paula! I haven’t played in years; probably never will either with my bad knee so the least I can do is drink the favored drink, right? 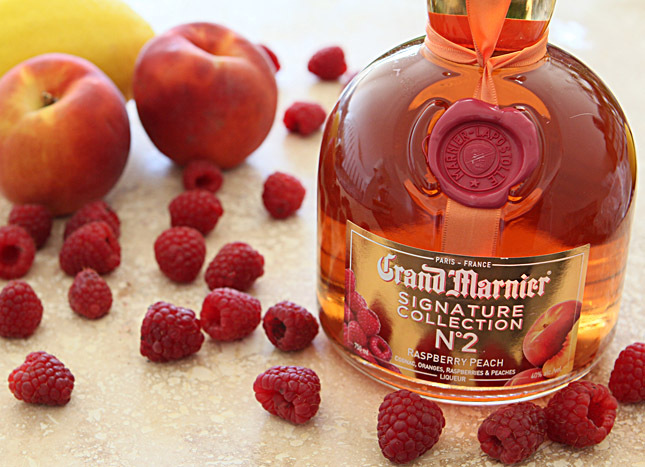 Grand Marnier in Peach and Raspberry flavor? WOW! Your Friday cocktails are the best! Thanks Claire, so glad you enjoy them and YES…it’s fabulous too! That would be perfect; I’m watching a couple of matches with friends and I know this will be made so we can pretend we are right there! I didn’t know the U.S. Open had an official drink- I’ve been missing out! Your version is very pretty with the raspberries. I guess the honeydew might look like tennis balls but that’s a stretch! I’ll stick with your creation. This one sounds delicious too, Barbara… I’ve not heard of the Raspberry and Peach Grand Marnier. It’s just coming out in September Lizzy so you’re not alone! They’re doing these annual special flavors and this is the one for this year. Very good cocktail; the kind I love…light and cold and refreshing.